Shopping for a new Subaru Impreza? Most Subaru Impreza buyers opt for the utilitarian hatchback body, and it’s easy to see why. 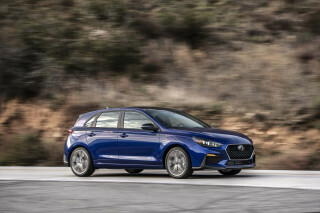 The 2019 Subaru Impreza compact sedan and hatchback stand out for their impressive all-weather ability, if not their outright performance. With the 2019 Impreza, Subaru courts its snowbelt base while piling on a high level of safety gear, a roomy interior, and decent fuel economy to appeal to places where snow isn’t a constant. 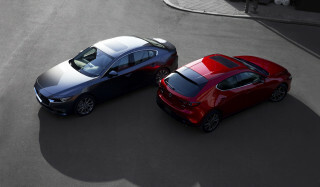 Base, Premium, Sport, and Limited trim levels, each available in sedan and five-door hatchback flavors are on offer. 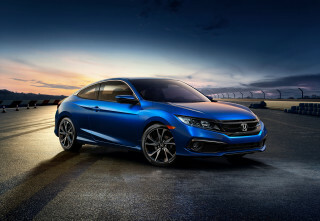 For 2019, automatic emergency braking and adaptive cruise control are now standard on the Limited and newly available on the base trim level. Under its hood, the Impreza’s 2.0-liter flat-4 shuttles 152 horsepower to all four wheels, making these Subarus among the only all-wheel-drive compact cars. A choice of continuously variable automatic (CVT) and 5-speed manual transmissions are on offer. The Impreza can feel sluggish at speed but the CVT works especially well in town to provide a zippy low-speed feel. In any trim, the Impreza handles well and provides a comfortable, composed ride. The Sport trim’s unique suspension dampers and steering tuning make it a little more fun, but it’s still short on power. The Impreza shares its structure, its body, and its interior with the Subaru Crosstrek, a high-riding, crossover-like vehicle that delivers real off-road ability at the expense of some handling prowess and fuel economy. The 2019 Impreza earns EPA ratings of up to 32 mpg combined, even though it comes with standard all-wheel drive. Inside, what the Impreza lacks in an imaginative design it makes up for in roominess. The hatchback with its 55.3 cubic-foot maximum cargo capacity is especially impressive. A high level of standard equipment including a 6.5-inch touchscreen for infotainment with Apple CarPlay and Android Auto. With every option box selected, the Impreza tops $29,000, but $25,000 buys the nicely equipped Impreza Premium hatchback with active safety gear that complements its impressive crash-test record. The 2019 Subaru Impreza’s clean and conservative looks will raise few eyebrows, and that’s just fine. All 2019 Impreza trim levels can be configured in sedan and five-door hatchback bodies. Our preference tends toward the latter, both for its longer roof and for its extra utility. 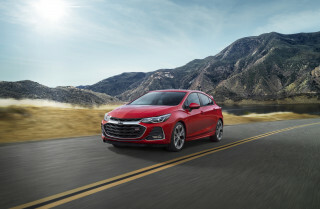 The sedan and hatchback share front end styling with big headlights that jut well into the fenders and surround a wide grille. The steel wheels covered in hubcaps in the base trim seem chintzy at these prices, however. Impreza Sports have dressier 18-inch alloy wheels and a body kit that works well with the car’s lines. Inside, the the Impreza’s controls are arrayed logically. Big climate control vents stand on either side of the 6.5-inch touchscreen for infotainment that’s standard fare. Spend more for the Sport and Limited trims and the 8.0-inch screen looks even better and is matched by stitching on the dashboard and door panels. The 2019 Subaru Impreza’s standard all-wheel drive is a boon, but it could be more powerful. With its standard all-wheel-drive system, the 2019 Subaru Impreza makes a smart choice in unpredictable conditions. We just wish it could power through snow drifts and rain storms a little better. The Impreza is no WRX, even though its 2.0-liter flat-4 makes some of the right noises. At 152 horsepower and 145 pound-feet of torque, it’s among the least powerful compact sedans. On the bright side, its sub-3,000-pound curb weight also makes it one of the lighter options available. The 5-speed manual transmission standard on base and Sport trims has an imprecise feel. The better choice here is the CVT, which does a good job of imitating a conventional automatic transmission when pushed thanks to a “stepped” mode that simulates real gear changes. At city speeds, the CVT and the snappy accelerator pedal give the Impreza a sprightly feel. That wears off quickly once speed builds, though. The Impreza makes highway passing a plan-ahead adventure on a flat road and an impossibility climbing a mountain grade. All Imprezas have a comfortable ride, even the Sport trim with its stiffer shocks and 18-inch alloy wheels. Sharp, well-weighted electric power steering helps the Impreza zip around corners on a curvy road. The Sport turns things up a notch with brake torque vectoring that tightens the inside wheel’s brake caliper in hard turns for crisp, tight cornering. The standard all-wheel-drive system keeps grip high even on dry pavement and is seamless in its operation. The 2019 Subaru Impreza has a spacious interior with good cargo utility in hatchback form. Up front, the Impreza has comfortable seats wrapped in tough cloth or less-than-luxurious leather upholstery. Only the Impreza Limited features a power driver’s seat, and even then it lacks lumbar adjustment. Rear-seat riders have good leg room and a nicely contoured seat. In terms of real-world comfort, the Impreza’s back seat bests some mid-size sedans. It’s cargo space where the Impreza really stands out. Hatchbacks boast 55.3 cubic-feet of cargo volume with the rear seatbacks folded. In full passenger mode, that figure slides to a still utilitarian 20.8 cubes. Sedans fare much worse, with just 12.3 cubic-feet. The $500 premium for the Impreza hatchback is easy enough for us to justify, and all but the base configuration feature roof rails that beg for a pair of mountain bikes or a kayak. Soft-touch materials adorn the Impreza’s dashboard and its front doors, but they’re about par for the compact car class. The 2019 Subaru Impreza aced crash tests and almost all versions are available with active safety tech. 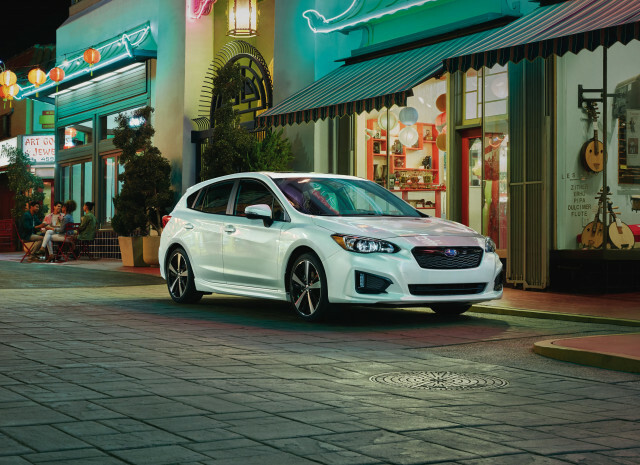 Top scores from federal and independent crash testers and a wide array of available collision-avoidance tech make the 2019 Subaru Impreza an excellent compact car choice when it comes safety. The Impreza comes with seven airbags, a rearview camera, and stability control. Optional on CVT models and standard on the Limited trim is a suite of crash-avoidance tech including automatic emergency braking, adaptive cruise control, and active lane control. Blind-spot monitors and rear cross-traffic alerts are optional on all but the base Impreza. However, the halogen headlights in base, Premium, and Sport trims rate only “Marginal” compared to the “Good” automatic high-beam LED headlights in the Limited. Standard all-wheel drive helps the 2019 Subaru Impreza stand out. The base Impreza doesn’t pamper with luxuries, but at less than $20,000 it doesn’t really need to. Standard fare includes a 6.5-inch touchscreen for infotainment with Apple CarPlay and Android Auto compatibility, air conditioning, power features, and Bluetooth. A 5-speed manual is standard and a CVT is optional for $1,000. New this year is a roughly $850 suite of active safety tech that includes automatic emergency braking, active lane control, and adaptive cruise control. It’s worth seeking out, even if it’s only available with the CVT. The Impreza Premium is our recommended pick for most buyers. For about $22,500, it builds on the base Impreza with the CVT and adds alloy wheels, heated front seats, a CD player, 6-speaker audio, and a host of minor convenience touches such as an acoustic windshield and a second USB port. The advanced safety gear suite available on the Premium costs $1,400, but it also includes blind-spot monitors and rear cross-traffic alerts. The Impreza Sport does a good job imitating a sports car on a curvy road and it adds some worthwhile features such as 18-inch alloy wheels, leather-wrapped steering wheel, and an 8.0-inch touchscreen for infotainment. Topping the lineup at about $26,000 to start, the Impreza Limited comes with leather upholstery, a power driver’s seat, automatic climate control, keyless ignition, adaptive cruise control, and automatic emergency braking. A handful of options are available that brings the price of a fully loaded Impreza to about $29,000. The 2019 Subaru Impreza’s all-wheel drive has little detriment on fuel economy. The 2019 Impreza hatchback with the CVT is most commonly found on dealer lots and is rated at 28 mpg city, 36 highway, 31 combined. Impreza Sports have 18-inch wheels with a slightly higher rolling resistance that dent each of those figures by 1 mpg with the CVT. On the flip side, the Impreza sedan is slightly more aerodynamic. In base, Premium, and Limited trim and the CVT, it’s rated at 28/38/32 mpg. Sports with the CVT come in at 27/36/30 mpg. Manual transmission Imprezas are harder to find on dealer lots and are less fuel-efficient. 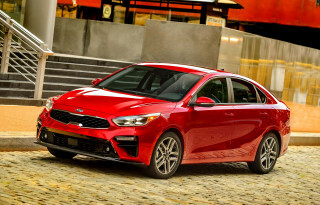 The thriftiest of the bunch is the base sedan at 24/32/27 mpg, while the thirstiest is the Impreza Sport hatchback at just 22/30/25 mpg.